Untie, discharge, retie and remove bulk bags dust-free BULK-OUT ® Discharger features a SPOUT-LOCK ® clamp ring* that creates a high-integrity, clean seal between bag spout and hopper, preventing contamination and dust during hook-up and discharge. TELE-TUBE ® telescoping tube raises the clamp ring to make connection, then lowers, applying continual tension to keep spout taut as bag empties/ elongates, preventing dead spots and flow restrictions. POWER-CINCHER ® flow control valve* cinches the spout concentrically for easy, leak-proof retying of partially empty bags. BAG-VAC ® dust collector creates negative pressure within dust-tight system to collapse empty bags prior to retying and disconnection, eliminating dust from manual flattening of empty bags. Unload bulk bags and rigid bins in low headroom areas FLEXICON ® Low Profile Split F r a m e U n l o a d e r a l l o w s discharging of bulk bags and rigid bins from mezzanines and other low headroom areas. Upper frame can be forklifted onto plant floor, loaded with a bulk bag, and then forklifted back onto the sub frame within several inches/centimeters of the ceiling. A POWER-CINCHER ® flow control valve* cinches the bag spout concentrically, preventing uncontrolled bursts of material from the bag, and allowing leak-free retying of partially empty bags. For unloading of bulk solids from rigid bins, the bins are forklifted onto receiving cups of the sub frame, and seated against a flanged chute discharging into a vessel below the mezzanine. Project Managers Dedicated To Your Success • The Lead Flexicon Project Manager supervising your system offers you a single point-of-contact through every phase of development, streamlining your communications • Strict adherence to your unique standards, documentation requirements and timelines • Commitment to the successful performance and cost effectiveness of your project by serving as your dedicated advocate Engineering Teams Ensure Smooth Integration • Engineering teams on four continents relieve your staff of overloading • Over 20,000 bulk handling installations worldwide provide the breadth and depth of experience essential for seamless integration with your upstream and downstream processes • Ability to work with the engineering firm managing your entire project, or directly with your team Effectiveness Only a Major Manufacturer Can Provide • As one of the world's largest manufacturers of bulk handling systems, Flexicon can provide the engineering, manufacturing, outsourcing, integration, programming and validation of your project—eliminating the risk of coordinating multiple suppliers • Greater efficiency and control than available through diversified engineering firms, dedicated equipment makers or in-house engineering departments with limited time and/or bulk handling experience USA sales@flexicon.com 1 888 FLEXICON CHILE UK GERMANY SPAIN AUSTRALIA SINGAPORE SOUTH AFRICA +56 2 2415 1286 +44 (0)1227 374710 +49 170 8 187 613 +34 930 020 509 +61 (0)7 3879 4180 +65 6778 9225 +27 (0)41 453 1871 Flexicon's Project Engineering Division can assume single- source responsibility for engineering, integrating, automating and supporting your large-scale bulk handling project— and guarantee its performance MANAGE LARGE-SCALE BULK HANDLING PROJECTS with control and efficiency unique to Flexicon flexicon.com FF-0516 ©2017 Flexicon Corporation. Flexicon Corporation has registrations and pending applications for the trademark FLEXICON throughout the world. *Patent(s) granted and/or pending Convey pneumatically to/from multiple discharge/inlet points PNEUMATI-CON ® Pneumatic Conveying Systems transport a broad range of bulk materials over short or long distances between single or multiple inlet and discharge points in small to high capacities. Offered in both positive pressure or vacuum configurations, from single- point "up-and-in" installations to mobile units to cross-plant systems. Options include rotary airlock valves, pick-up adapters, filter receivers, cyclone separators, fill/pass valves, hand-held pick-up wands, silos, day bins and more. Available designed, constructed and finished to industrial and sanitary standards. Expert application engineering assistance offered for seamless integration with your upstream and downstream process equipment and storage vessels. Dispense and position pallets automatically FLEXICON ® Pallet Dispenser with Powered Roller Conveyor auto- matically dispenses and positions pallets, significantly improving safety and efficiency over manual methods. Accommodates 40 x 48 in. and 42 x 48 in. (1020 x 1220 mm and 1070 x 1220 mm) pallets and non-standard sizes. Dispenser forks lower the pallet stack onto the roller conveyor, withdraw from the bottom pallet, and raise the remaining pallets, allowing the conveyor with photoelectric sensors to position it. Audible signal and/or flashing light indicate low pallet level. Easily integrated into palletizing/filling systems for drums, pails, bulk bags, sacks and other containers/packages. Fit tight spaces, sanitize easily with tilt-down bulk conveyor FLEXICON ® Mobile Bulk Conveyor with Tilt-Down Portable Base fits through tight spaces and provides easy access for removal of the flexible screw. A reduced footprint enables the caster- mounted frame to maneuver through narrow aisles and around corners. With hopper, support boom and conveyor assembly tilted down, the unit fits through standard doorways and provides easy access for removal of the flexible screw for sanitizing and inspection. A broad range of specialized screws is available to handle free- and non-free-flowing bulk materials. Offered in carbon steel with durable finishes, and in stainless steel to industrial and sanitary standards. 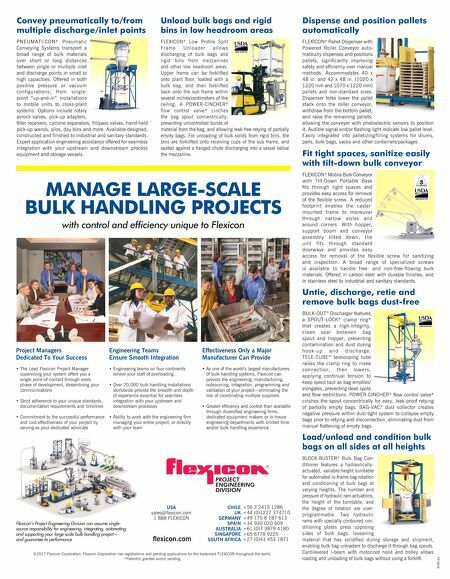 Load/unload and condition bulk bags on all sides at all heights BLOCK-BUSTER ® Bulk Bag Con- ditioner features a hydraulically- actuated, variable-height turntable for automated in-frame bag rotation and conditioning of bulk bags at varying heights. The number and pressure of hydraulic ram actuations, the height of the turntable, and the degree of rotation are user- programmable. Two hydraulic rams with specially contoured con- ditioning plates press opposing sides of bulk bags, loosening material that has solidified during storage and shipment, enabling bulk bag unloaders to discharge it through bag spouts. Cantilevered I-beam with motorized hoist and trolley allows loading and unloading of bulk bags without using a forklift.